Many teen girls wear their 'tough girl' exterior - creating a barrier between themselves and their fragile hearts, spirits and the world. Don't be fooled by her eye rolling and the sucking of her teeth. If you look deeply into her eyes past her fears, hurts, shame and sadness, you will see a spirit that wants deeply to find or fulfill her purpose and mission. 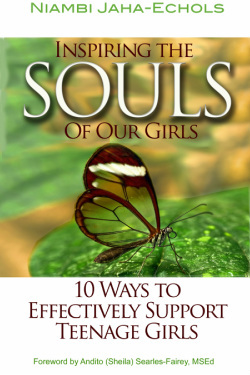 "Inspiring The Souls Of Our Girls" is an invaluable tool for anyone looking to enhance and deepen their outreach to our girls.